Be it FIANZ nationally, or organisations such as Muslim Association of Canterbury, Canterbury Muslim Community Trust, and Nawawi Center in Christchurch. They have left no stone unturned in making sure that the wider communities know about Islam and its practices. Islam Awareness Week, Mosque Open Day, arranging mosque visits for local journalism students, celebrations of Eid which are open to all, are some such examples. And yet, my unscientific surveys of talking to many, many locals - over the three-and-a-half years I stayed in Christchurch and circled the South Island at least three times - indicated that not many people there actually know what Eid is. To which I used to say, rather simplistically," What Christmas is to Christians, Eid is to Muslims." You can tell your party machinery to ask around as well. I am sure they will find the same results. The point is, and here I refer to what Damon Salesa, Pro Vice-Chancellor (Pacific) of University of Auckland, noted at a Ministry of Foreign Affairs (MFAT) discussion held in November last year on Superdiverse Auckland and the Future of Foreign Policy. He called New Zealand schools “the most segregated part of our society" giving examples of some local schools in Auckland with only children from Maori, Pasifika and refugee backgrounds. When talking about Auckland - our most diverse city, he added, "The title of this event itself is Superdiverse Auckland. But Auckland is superdiverse only in terms of its population, and not in terms of our living. Each segment of population [race or religion] has its own shopping centres, places of worship, restaurant etc., where they go frequently and only interact with people similar to them. There is not much intermingling. Not much getting to know each others culture." If this is the situation in Auckland, imagine how much work needs to be done in other places, especially in the South Island, which is not so diverse even in terms of the population. Also, it will do us good to read last year’s report by the Children's Commissioner, as noted by Glenn McConnell's in his piece "Taika Waititi's right, New Zealand really is a racist place". Something very troubling, which should make everyone sit-up and notice, is when he writes," If we open our ears to hear the stories of everyday racism, then the bubble is popped. It's popped when you read a recent report from the Children's Commissioner, highlighting how racism is impacting African, Middle Eastern, Asian and Polynesian students. Children go to school and face derogatory slurs and ignorant judgements...more students shared similar stories, showing racism is alive and well even within our youngest." I am sure your two responsible parties will do the right thing in terms of gun control in New Zealand. But the real change will come – in terms of building a harmonious society where every religion and race is respected, and people of every colour have a sense of belonging - when we start educating and making aware our younger generation of the diversity around us. When every child in New Zealand knows what Eid is, what Ramadan is, what Diwali is, what Chinese New Year is, what Hanukkah is, what Gurunanak Jayanti is, and what Vesak is. This will be a small initiative, which won’t require any additional government resources, but will make sure that our coming generation is better informed than we are. I think all of us will agree that ignorance can only be challenged by knowledge, and hate can only be challenged by love. They are us. We are them. Let’s put some action into it. 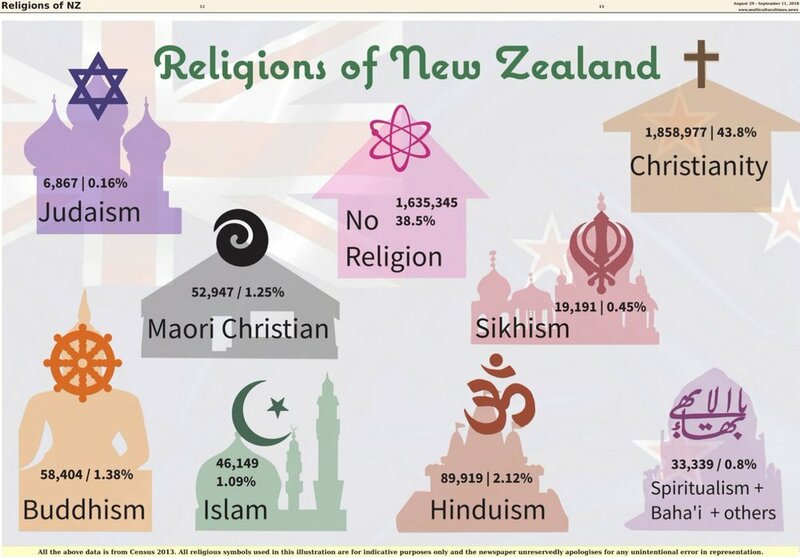 Listen carefully, with compassion and an open mind, when she says, "It is time for New Zealand to acknowledge Islamophobia is rife in New Zealand and that our current discourse on racism and it’s watered-down corporate cousin, ‘diversity and inclusion’, falls woefully short." This newspaper joins these three, and many others in calling the entire country for deep introspection. As Sharma puts it,"...over the next few days, as we assess the recent events from Christchurch it is important that we don't just label this as a hate crime done by an outsider (Australian) in New Zealand. If we fail to acknowledge that we do have a problem with racism in our own country, we will fail to address the issues that many of us coloured kiwis face on a day to day basis." For a even detailed list, read Glenn McConnell's piece "Taika Waititi's right, New Zealand really is a racist place". Read when she writes "At least five years of solid government engagement across a National-led and then a Labour-led government. We begged and pleaded, we demanded. We knocked on every door we could, we spoke at every forum we were invited to. At a major security conference in February 2018, Aliya challenged the sector: if you can spend so much on surveilling our community, why can you not spend on preventative programmes?"